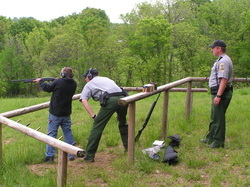 Get Hunter Education Certified through Outdoor Conservation!! 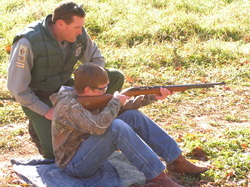 It is a pleasure to offer Outdoor Conservation (Hunter Education) at Jefferson West Middle School. We began this journey to implement the program 6 years ago. It has become a very popular elective course for students and our community. Many of our young students have gained an appreciation of hunting and the benefits of conservation on our land and resources. 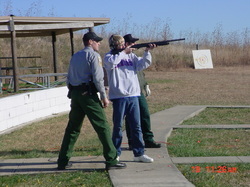 Through taking this course, students will recieve their Hunter Ed Certification through Kansas Dept. of Wildlife and Parks if they pass the test. A major benefit of this Outdoor Conservation is that we are able to spend many more hours of classroom time than is required because it is a semester long course. With our extra time, we will study treestand safety, archery shooting, and even experience shooting a 20 gauge shotgun/22 caliber rifle. If students ever decide to enjoy the great outdoors through hunting, they must have this certification. Why not take it during school? 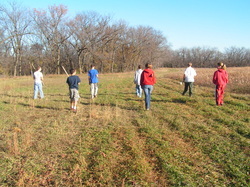 Going on our field walk! Demonstrating Safety! !